747 Pan Am Boeing that exploded, killing all 259 on board and 11 on the ground. Nearly 20 years after the terrorist bombing of Pan Am Flight 103 bound for New York City from London, the only man ever convicted of the attack may be headed back to court for an appeal. On Thursday, the Scottish Criminal Cases Review Commission (SCCRC) announced that it referred the case of former Libyan intelligence officer Abdel Basset Ali Al-Megrahi back to the country's High Court system. The SCCRC said Megrahi, currently serving a 27-year minimum sentence, is entitled to a new appeal because he may have suffered a miscarriage of justice in 2001 when he was convicted by a panel of three Scottish judges for the 270 murders resulting from the bombing. There may be no more controversial terrorism case. 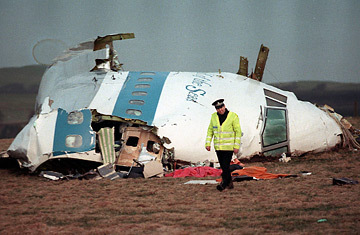 Yesterday's SCCRC report has implications for the U.S., Libya, Iran, Syria, and, of course, Scotland, where Flight 103 crashed down on Dec. 21, 1988, killing everyone on board and 11 on the ground, spreading debris for miles around the small town of Lockerbie. Since that day, the case has been shrouded in mystery. A massive international investigation  run jointly by American and Scottish law-enforcement agencies  eventually nabbed two Libyan suspects. The motive: they were supposedly acting with their country's blessing in retaliation for 1986 U.S. air strikes that killed one of Libyan leader Muammar Gaddafi's adopted children. Libya's recent return to the fold of nations depended on that country turning over its Lockerbie suspects in 1999, and then, after the trial, accepting responsibility and compensating the victims' families, a settlement hammered out in 2002 and 2003. Libya agreed to pay out $2.7 billion for the bombing. But only one of the Libyans, Megrahi, was convicted  a verdict several parties have disputed, including a U.N.-appointed observer who complained of a "political aura" at the initial trial. The SCCRC's ruling is certain to fan that controversy, even though the Commission said nothing to support the view that political pressure influenced the judicial proceedings, and rejected allegations of CIA conspiracy during the investigation. After a three-year review, the Commission has produced a report more than 800 pages long, plus supplementary documents. The report is not public. But the Commission outlined its reasons for a new appeal in a 14-page public statement, identifying six grounds where a miscarriage of justice may have occurred. All the criticism, in essence, centers on the identification of Megrahi by a Maltese shopkeeper, and whether the date of their alleged meeting is correct. According to the Commission, a combination of evidence not available at the trial and not adequately considered at the trial, sheds doubt on a cornerstone of the prosecution case: that Megrahi was in all the right places to have prepared the suitcase that carried the explosive device. The Edinburgh High Court will now review Megrahi's case  though it may take months, according to a High Court spokeswoman, to find the five judges needed to hear it. Even before they do, the fall-out of the new ruling is being felt around the world. Here's what a new Lockerbie appeal means for the major players. Libya has always walked a fine line over its role on the bombing. Despite its official acceptance of some responsibility for the attack, its leaders have always maintained they had nothing to do with it, and that accepting blame was the political price for getting back into the U.S.'s good graces. "Until now the perpetrators are unknown," Gaddafi told TIME in 2006. The Libyans reiterated their denial of guilt following Thursday's SCCRC report. "We believe that our citizen is innocent and we have nothing to do with Lockerbie," Gaddafi's son, Seif al-Islam, told TIME. But accepting responsibility for Lockerbie in 2003 was a condition of the U.N. lifting sanctions and the U.S. removing Libya from its list of states sponsoring terrorism. The North African state is now a strategic partner for the U.S. in its anti-terrorism efforts and as a major oil producer. If Megrahi is acquitted, Libya and the U.S. will both likely tread carefully. Neither seems to have much to gain from upsetting their current relationship, but an exoneration of Megrahi would be a sign to the world that, perhaps, Libya has been unjustly penalized. Gaddafi's son claims that, for now, Libya has no plans to recoup the money it has paid out to compensate the victims. The decision also threatens the West's distinctly less comfortable relationship with Syria and Iran. Shedding doubt on Megrahi's guilt automatically shifts public attention back to the original Lockerbie suspects: the Syrian-based Popular Front for the Liberation of Palestine-General Command (PFLP-GC). Before investigators uncovered a Libyan connection, they seriously considered that PFLP-GC members carried out the attack at the behest of Iran. Iran had vowed revenge for the 1988 U.S. downing of an Iran Air flight and, according to statements from a now-retired CIA agent that were submitted by the defense to the SCCRC, transferred $11 million to the PFLP-GC just days after the attack on Flight 103. A wide range of conspiracy theorists speculate that U.S. authorities somehow pushed the investigation away from Syria and Iran in exchange for cooperation during the first Gulf War. Libya, the skeptics claim, was just a convenient political target at the time. The Scottish Commission considered and rejected this scenario. No one now expects that Western governments will seriously entertain the idea again. But by calling into question the evidence in the case, the SCCRC left the door open to the ever-popular and persistent conspiracy theories. The Lockerbie attack is still a raw wound in the U.S.: Killing 189 American citizens, it was the deadliest terror attack on U.S. civilians until 9/11. The SCCRC report  issued just one day after staunch Bush ally Tony Blair stepped down as U.K. Prime Minister  may prove to be bad news for U.S.-British relations. The Scots' report pokes holes in evidence pieced together under the FBI-led investigation. "This was the first major international terrorist investigation where countries had to work together. This was a model," says Richard Marquise, the former FBI agent, now retired, who led the U.S. task force on Lockerbie. If Megrahi now goes free, it raises new questions about how efficiently American investigators can work with local authorities elsewhere to pursue terrorist suspects to all corners of the globe. To a greater extent than in the U.K., Americans involved in the case stand behind the conviction. "I am convinced of Mr. Megrahi's guilt," says Marquise. "It would have been great to have DNA, to have 10 eyewitnesses. Unfortunately, there's no such thing as a perfect case," An FBI spokesman in Washington says the Bureau will not comment on the SCCRC report as the matter is now pending in court. However careful the wording of the SCCRC report, it's hard not to take "miscarriage of justice" as criticism of the three-judge panel that convicted Megrahi. Robert Black, the Scottish lawyer who designed the court structure at Camp Zeist in the Netherlands (a political compromise between Scotland, the U.S. and Libya so the case could be heard) calls Megrahi's 2001 conviction "an absolute and utter outrage." But if, indeed, Megrahi has suffered a miscarriage of justice, the appeal may be a chance for Scotland to redeem itself, says Black. Some changes have been made already. First, the Scottish Criminal Cases Review Commission, the official judicial scrutinizer that issued yesterday's report, did not even exist when the Camp Zeist trial was planned. Second, judges are now nominated by an independent board. The judges at Megrahi's trial would have been nominated by the Lord Advocate, who is also the chief adviser to Scotland's public prosecution  a system that may have made it hard in the past for judges to avoid the appearance of conflict of interest. Both moves, says Black, were brought in largely to help Scotland comply with the European Convention on Human Rights. Since the Scottish National Party is now in power in Scotland, favoring greater autonomy from the central United Kingdom government in London, Scotland may jump at the chance to demonstrate renewed independence and competence  or at least distance itself from past controversy. Megrahi's fate is unclear. Former FBI investigator Marquise readily admits the case against him is based on "a series of circumstances," and all must be true for Megrahi to be guilty. With a tiny fragment of circuit board found at the crash site, investigators pinned the bomber to an unusual style of Swiss timer, manufactured by a firm that claimed to supply the Libyan military. Clothing scraps from the suitcase carrying the explosive device were linked to a source in Malta. And the Maltese shopkeeper identified Megrahi (many months after the bombing) as the Libyan who bought the clothes. According to the prosecution, Megrahi then sent the bomb-laden suitcase from Malta, via Frankfurt, to London Heathrow airport, where it was loaded onto Pan Am Flight 103 to New York's JFK Airport. Many skeptics find that storyline implausible: too complicated, and too dependent on a charitable reading of evidence and witness testimony. That's why the PFLP-GC theory has never died and why some even believe, as the defense suggested at Megrahi's original trial and asked the SCCRC to consider, that the circuit board so crucial to the Crown case could have been fabricated. The Commission examined the claim, and found no reason to believe the circuit board had been planted.